Beto O'Rourke is considering a 2020 presidential campaign much like he ran his 2018 U.S. Senate campaign: on his own terms. But O'Rourke, in many ways, is following the playbook — or lack thereof — of his freewheeling Senate race, when he eschewed political norms for a do-it-yourself attitude inspired by his past campaigns and even earlier punk rock days. He seemed determined to do the opposite of previous statewide Democratic campaigns and chose to visit every Texas county over hiring pollsters or relying on consultants. 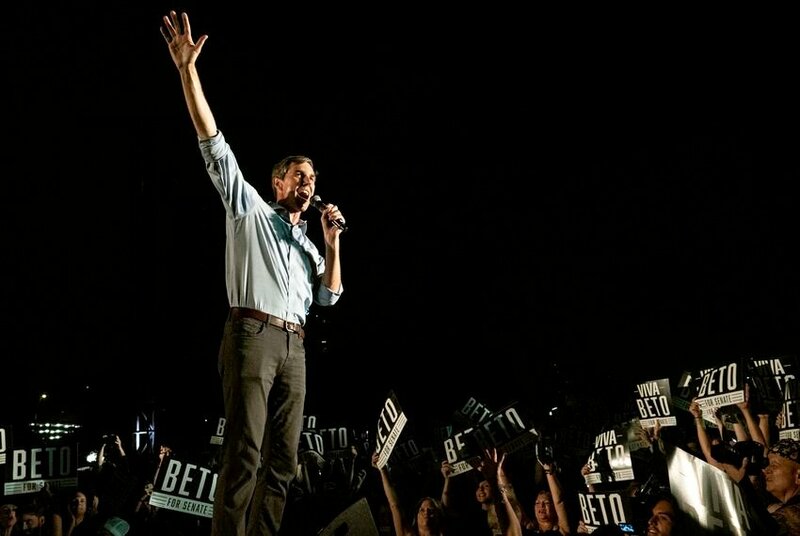 "From what I’ve heard about Beto as a person, from folks real close to him, it's that he doesn’t play by the same rules as everyone else does, he’s not a typical politician," said Nate Lerner, one of the co-founders of a group working to draft O'Rourke into the presidential race. "He could enter the race really late — or tomorrow." In the meantime, invitations continue to pour in for O'Rourke to take the more traditional route of a prospective presidential candidate and test the waters with trips to Iowa, New Hampshire and South Carolina. His team continues to neither accept nor reject them, telling at least some of the senders that O'Rourke does not have any travel plans at this time — but the team will be back in touch if that changes. In Texas, some former campaign staffers are sitting tight to see what he does, reluctant to sign on with other 2020 campaigns in the meantime. O'Rourke is keeping a tight inner circle, and while there have been reports speculating about the contours of a potential 2020 campaign, there is also a recognition that he has long served as his own strategist and decisions are not made until he is fully comfortable with them. As O'Rourke has contemplated a 2020 run, the primary field has expanded considerably. In recent weeks, it has grown to include fellow Texan Julián Castro, the former U.S. housing secretary and San Antonio mayor; U.S. Sen. Elizabeth Warren of Massachusetts; U.S. Rep. Tulsi Gabbard of Hawaii; U.S. Sen. Kirsten Gillibrand of New York; U.S. Sen. Kamala Harris of California; and Pete Buttigieg, mayor of South Bend, Indiana. Some allies believe O'Rourke, with his fervent following and sustained ability to command media attention, can afford to take longer than other potential candidates to decide. But other Democrats — particularly in the early voting states — are not so sure. "Right now it’s getting to be really, really hard to hire good staff in Iowa," said Sean Bagniewski, chairman of the Polk County Democratic Party in Des Moines — among the groups that have invited O'Rourke to speak to no avail. "They're in very high demand; they're signing up very quickly." A pair of similarly named "Draft Beto" groups has sought to lay the groundwork for O'Rourke in the early voting states, hiring local operatives and hosting organizing events with the goal of creating a campaign-in-waiting. But they, too, are waiting for a fresh cue from O'Rourke. That could come at what is expected to be his next major public appearance: a Feb. 5 interview with Oprah Winfrey in New York City. "I'm happy to give him some space, give him room, but in the very near future, something's got to start shaking," said Boyd Brown, a former South Carolina state legislator who serves as national senior adviser to one of the draft groups. In the Palmetto State, Brown added, "folks are starting to get antsy ... and he needs to shoot a flare gun in the air and let us know, 'I am doing this,' or show us signals." O'Rourke's recent road trip offered little in the way of clear 2020 signs but provided a potentially revealing arc for his close followers. As he embarked on the trip, he admitted he had been "in and out of a funk" recently and expressed hope that returning to the natural habitat of his 2018 campaign — the wide open road — would help him clear his mind. His most recent post, published late Thursday, showed him finding joy again in the company of others and voicing optimism that Americans will be able to overcome current political divisions. Among the places that O'Rourke stopped on his trip was a community college in Pueblo, Colorado, on Jan. 17. Tracey Ejianya, the student body president at Pueblo Community College, said she received a one-hour heads-up that O'Rourke would be coming to the school for a discussion with students. A native of Jacksonville, Texas, who had followed the Senate race, Ejianya quickly made arrangements for her two children so she could attend. O'Rourke opened the discussion by acknowledging he could run for president and was hitting the road to learn about the issues important to small-town America, Ejianya said. But beyond that, she added, O'Rourke did not mention 2020 — or politics, for that matter — as he largely ceded the conversation to the students to hear what was on their minds, only occasionally jumping in with his own thoughts. The discussion lasted about an hour and a half, Ejianya said, and afterward, a smaller group including her and one of her sons went to an Irish pub with O'Rourke. There, O'Rourke continued to mostly listen as the locals shared their personal stories over the course of two hours. "I came home just feeling empowered — that's how he made me feel," recalled Ejianya, who said she does not associate with a political party but likes the idea of an O'Rourke 2020 campaign. "I couldn't even sleep that night because I was so excited and so empowered and so moved." O'Rourke returned from the road in time to attend the Women's March on Saturday in El Paso, where his friend and successor in Congress, Rep. Veronica Escobar, spoke. O'Rourke, according to the El Paso Times, just stood in the crowd and listened.